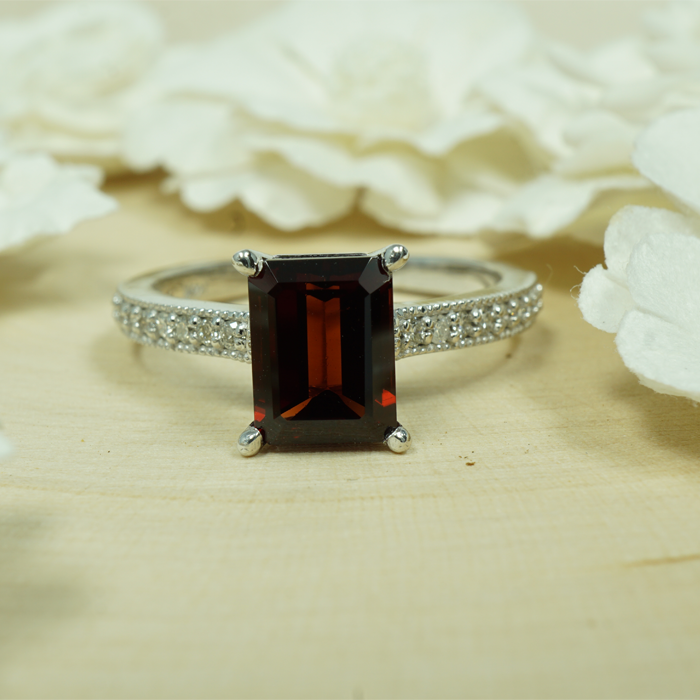 Color: According to Gemological Institute of America, the most valued amethyst color is a vibrant reddish purple or a deep purple variant with no apparent color zoning. Many lesser-valued amethyst stones are more pale in color or have hues of brown or bronze in them, so it’s important to look for any noticeable color zoning in order to determine quality. This can be tested by viewing the stone face-down through its pavilion against a white or light-colored background. Another way to see the stone’s truest colors is to view it in daylight or a specific jeweler light, as opposed to under artificial indoor light. Clarity: Today, many faceted amethyst stones on the market are eye-clean, meaning they are absent of any visible inclusions and display high clarity. If held up to the light, the stone should permit all the light through it. Cut: There are a variety of shapes and styles that are used on amethyst stones, ranging from round, oval, pear, emerald cut, triangular, marquise, cushion and other similar variations. Other styles include the classic triangular shape and kite-shaped facet arrangements known as brilliant cuts, rows of concentric parallel facets known as step cuts, and a combination of both facet arrangements known as mixed cuts. Carat: Unlike other gems, amethyst’s value per carat isn’t significantly higher with heavier stones, since it is much more abundant in large sizes than others. It is often found in a calibrated cut, meaning that it is cut exactly to standard industry sizes. However, there are more expensive amethyst gems, which are dark, deep purple stones called Deep Russians or Siberians. Because these are so rare, they are usually priced at a much higher rate of $50,000 per carat.